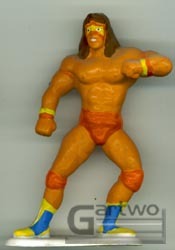 Applause released several WWF products at the dawn of the 1990's. 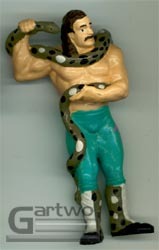 There was a set of five figures mounted on white stands & a set of four figures that were "free standing". 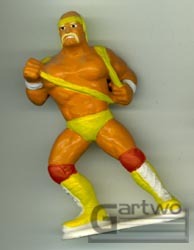 There were also pencils that featured WWF PVC "toppers" attatched to them. In addition to all of this, they also released the PVC figures you see below as keychains (minus the white stands). 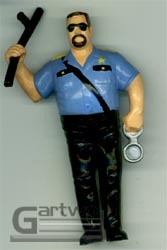 Not part of the Applause line, here's a tiny PVC figure of Sgt. 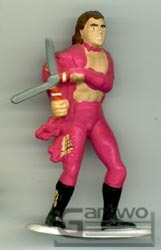 Slaughter produced by Hasbro in 1989. It was part of a premium offer for their GI Joe figures. 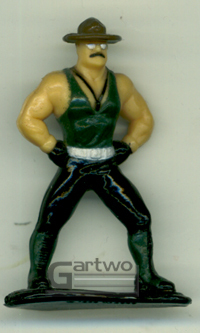 Don't be fooled by the pic, it's a very small figure, standing only about 1 inch.